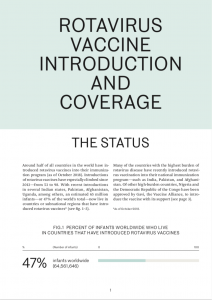 Which rotavirus vaccines are globally available and what new vaccine products are in the pipeline? Which countries have achieved major reductions in hospitalization and death through the use of rotavirus vaccines? With over 95 countries currently using rotavirus vaccines, what are the major barriers to further introductions? On 7 May 2019, the ROTA Council will preview a new series of briefs, Rotavirus Disease and Immunization. This is the most comprehensive source of information on rotavirus disease and vaccines since the Council’s 2016 white paper. Six rotavirus-focused briefs cover epidemiology and disease burden, available vaccine products, the impact of vaccination, economic costs of rotavirus disease and the value of vaccines, safety, and introduction and coverage status (see cover at left). The Council’s series also includes a supplemental brief on the broad impact of early childhood diarrhea. On 7 May 2019 at 8:00 EDT | 13:00 BST | 17:30 IST, join Dr. Mathu Santosham, Chair of the ROTA Council and Molly Sauer, Deputy Director of the Policy, Advocacy, and Communications at the International Vaccine Access Center—with Council members and allies—to explore and discuss the new series of briefs. Register your interest here to join. Featured graphic: Coverage rates for rotavirus vaccine using the WHO-UNICEF estimates for 2017. Map shows some countries that have recently introduced and may not have fully scaled up coverage. We look forward to hearing from you about what you think is necessary to expand access to rotavirus vaccines for children globally.